Looking for a chicken recipe that is super quick to whip up, and has tender chicken, creamy pasta, and offers a bit of a kick? That is exactly what you get with this Instant Pot buffalo chicken pasta. It is ready to be served in under 30 minutes, and let me tell you the flavor factor is spot on! I love pretty much all that has hot sauce, it is a natural choice to use it in this dish. 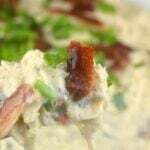 The hot sauce mixed with the ranch and bacon, really adds so much flavor and dimension to the dish. Change things up and add a new recipe to the mix, this is a family favorite I have been making for years! This recipe is similar to what you would call an adult version of mac n cheese that got a major upgrade. 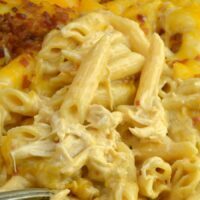 You have shredded chicken, bacon, pasta, lots of cheesy goodness, some heat from the hot sauce, and ranch for a mix of flavors. Instant Pot Buffalo Chicken Pasta dish is so so so good, and it is so quick to whip up. Cook it all in your Instant Pot for a quick dinner, and the leftovers taste even better the next day! The flavors really infuse well together. Also if you like a little spice you also need to try my Instant Pot Buffalo Ranch Chicken Dip! 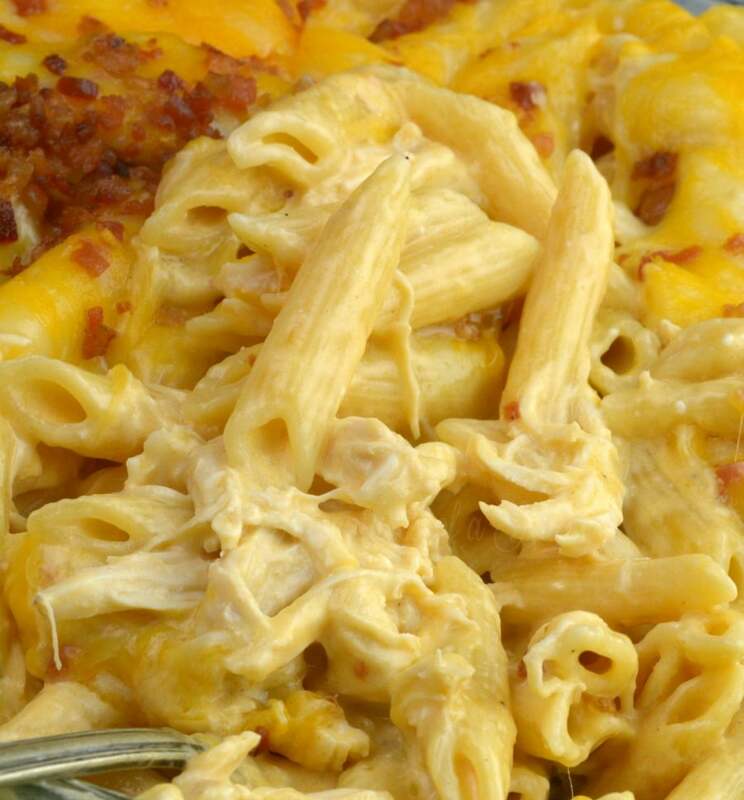 It is perfect for game nights, potlucks, and a special treat to break up the week. Mother nature keeps playing tricks on me! One day it shows signs that spring is right around the corner, and the next we have a blanket of snow on the ground. Once the warmer weather hits, I like to have quick meals like this I can make so I can spend as much time outdoors soaking up the warm sunshine and enjoying my days. I am pretty over this year’s winter, as it has been a pretty cold one. But soon enough spring will be in full effect. I know the grass and flowers are working on sprouting and soon our world will be filled with pretty colors. Love Spice Dishes? 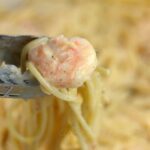 You may like my Instant Pot Bang, Bang Shrimp Pasta Carbonara or even my Crack Chicken. So if you like easy meals, that are hearty and wholesome, and full of delicious goodness, then this is a must try recipe. Dust off your Instant Pot and get to cooking. Or if you are like me, you don’t allow your Instant Pot to have time to collect dust cause you are always using it! Place 1 tbs butter and breast in the Instant pot with one cup water. Place on the Poultry button or 14 minutes manual high pressure. Remove chicken only and shred. In a small bowl mix together cream cheese, ranch, hot sauce, until creamy. Pour in pasta 2 cups water and place mixture on top do not stir. Stir and remove place in a pan top with cheese and broil for 1-2 minutes just to melt cheese. We don’t eat pasta. I wonder if diced potato or something else can be used in place of pasta? This looks yummy! Is that 40 ounces of cheese? OMG does that sound amazing! Cannot wait to try it! This will only be my second insta pot recipe, but I have heard that for some recipes you put the chicken in frozen. 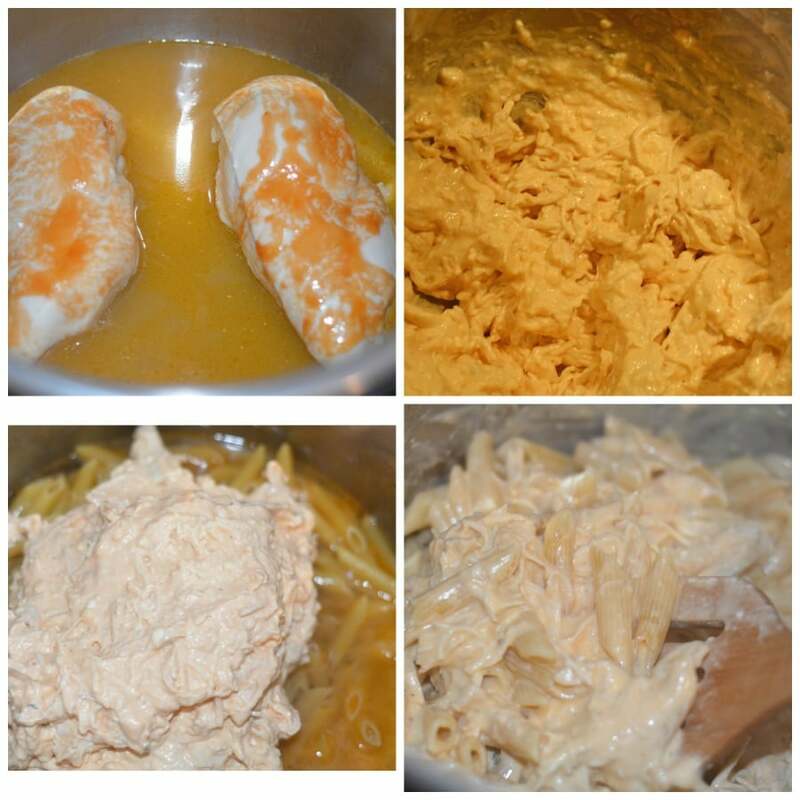 Do you used thawed chicken or frozen chicken for this Recipe? Looks yummy can’t wait to try! Looks yummy can’t wait to try my kids will love! Sounds yummy, I’m not a huge fan of ranch, do you have a ranch replacement recommendation? I’m going to try blue cheese dressing instead of ranch. This was so good. We don’t are much for hot sauce so I used a bottled wing sauce frim our local wing restaurant. Gluten Free: so I tried it with a corn pasta tonight. 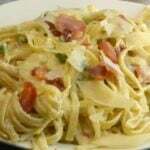 I substituted 16oz of corn pasta with 3 cups of water. Then piled everything else on top. We use pre cooked chicken to speed things up. Made this today for lunch! It was amazing!!!!!!!!!!!!!!! Thank you. I’ve made this 3 times and I have yet to complete it in 22 minutes. It’s more like 45 to 50 minutes by the time it takes to shred the chicken. This is soooo delicious, and yes sometimes i yse blue cheese dresding and also tried it with bottled avocado ranch dressing. Hand mixer or kitchen aid work amazing at shredding chicken! I have a cuisinart pressure cooker but I was on the hunt for new recipes to try and found this one. I was unsure about the water ratio, it seemed like it would water this down…but I held to the original recipe on this one. This dish was AMAZING. No lie, it’s 8:30 am and I’m having leftover pasta for breakfast!! The ONLY thing I changed is this: After I shredded the chicken, I put my pot on the saute setting. I added the cream cheese, ranch and hot sauce and basically melded it all in the same cook pot. No point in having to wash a second pot IMO. I added the water and pasta…switched back to pressure and it was done in like 7 mins. OMG does that sound amazing! This was so good. We don’t are much for hot sauce so i used a bottled wing sauce frim our local wing restaurant.Can i try it that recepi! This was truly amazing! I used dry ranch mix with a little milk instead of dressing. I also saw it as 40 ozs of cheese. Even this Wisconsin girl said what? Thankfully someone pointed out the missing space as I asked for opinions on using the dry mix. It was even weight loss eating friendly. Well, it’s so tasty it was really hard to stop, but I did. Can’t wait for leftover time! I made this as my first dish in my IP! I used Laughing Cow white cheddar cheese instead of cream cheese and it was delicious-thank you! Do I precook the noodles? IP newbie here…Just took it out of the box tonight! Do you put the pasta in uncooked? I made this tonight with some modifications, and it was so good! I wanted to speed up the process, so I put the pasta and water (I used chicken broth) in the instant pot then placed the trivet on top of the pasta. I put a small pan on top of the trivet and put the chicken, hot sauce, 1 cup broth, ranch seasoning instead of dressing (to save fat & calories) and a few pats of butter. I set the timer for 6 minutes and took the pan out to shred the chicken. Threw everything back together along with the cream cheese and shredded cheese. I forgot the bacon, but it was delicious still, and so fast and easy! I think I will make it for a work pot luck next week. Thank you for this tip!! What pan do you use that you put inside the IP?? This was so delicious! Way better than crack chicken! Made this tonight for dinner. Amazingly delicious. Definitely making this again and again. In the directions it says “poultry button OR 14 minuets on manual high”. Is it 14 minuets for the poultry button too? If not how long for that button? I haven’t used the poultry button yet and have no reference of timing with it. This dish looks and sounds Fabulous! My poultry button is 15 minutes. My chicken was almost all the way thawed and it cooked perfectly. Does “2 large chicken breasts about 1 pound” mean each breast should weigh 1 pound, or collectively, they should be 2 pounds? Literally make this at least once a week! Our favourite meal!!! Do I empty the water after I cook the chicken? Or just leave what’s left and add the 2 cups water and pasta? Thanks for answering i was wondering to..it said to take out only the chicken but didn’t say what to do with the fluid after.. making this for supper tonight..
Should I use 4cups of water for the pasta because I’m not doing the chicken with 1 cup of water? Thanks. Quick, easy, and cheap dinner! This is my new go-to recipe!! I don’t change a thing. This calls for 1/4 cup hot sauce. Do you use it to coat the chicken in the beginning? In Step 5 it says to combine the hot sauce with other ingredients, so I’m just wondering if you are to split the hot sauce or use extra to coat the chicken? I followed most ingredients & many directions… ha! … and we loved it. What I changed: I did not return shredded chicken mixture to pot. (I heated the shredded chicken,Buffalo ranch mixture a little in microwave.) I left it separate from (penne) pasta & served both with more Buffalo sauce available. When pressure cooking the (penne) pasta I cooked it as directed. After quick release, I added 2-4 oz cream, 1/2 t dry mustard, and over 8 Oz shredded cheese (sharp cheddar and a Mexican blend). It melted to a smooth awesome sauce. Then everyone served themselves the homade Mac n cheese with Buffalo ranch chicken on top, mixed in, or on the side. It was a hit. Made this last night. Only thing I did different was add and saute one small onion and approximately 1 tbsp of garlic to pan with 2 tbsp butter for about 3-4 minutes. Turned off saute then followed recipe. I did not have enough Ranch dressing, only 3/4 cup so added 1/4 cup of 1/2 and 1/2. Used 12 oz of pasta. This recipe is very good. Thank you. Do I place the chicken on the trivet? Or lay directly in the pot? Wasnt sure if it would burn. Newbie here. Will only be my 4th recipe! Hiiii thanks so much for the recipe! It was delicious and soooo creamy! I was in a terrible hurry to make dinner and made a couple of changes so I could cook it all at once! At the bottom of the Instant Pot, I put in the pasta and just enough chicken broth to cover it. We make this weekly! Soooooo delicious!!! I am new to IP. I have an 8 oz. IP duo. Do I need to increase the cups of water when cooking the chicken breast from 1 cup to 2 cups or does it not matter what size IP I have. I’m confused on this? My husband LOVES this one! Even better than the fajita soup! This will be my fast go-to dinner! I used whole wheat pasta and a little less hot sauce (but he adds more on his). I’m really liking these recipes. Thank you SO much! This recipe is one of my FAVORITES for the instant pot! Do you know if it would freeze well? I was thinking of making the whole dish and putting it in a pan and then freezing it. What are your thoughts? Can you use a ranch powder mix instead of dressing? Made this twice. Both times salvaged it but got burn message due to pasta andy easy fix?